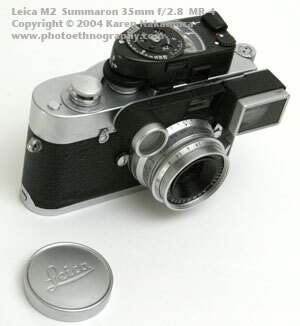 When it was released in 1954, the Leica M3 was received with widespread acclaim. It was clearly the best 35mm camera in its class with a superior rangefinder that had bright automatically switching framelines. But that does not mean that the M3 did not have its faults. There were at least two glaring problems: 1) it was incredibly expensive, much more than other rangefinders; and, 2) the 50-90-135mm projected RF framelines did not match the wide-angle needs of photojournalists who were used to using 35 mm wide-angle lenses. 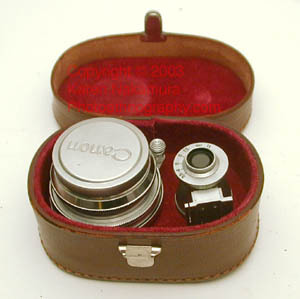 In response to these criticisms, Leitz released the Leica M2 in 1957 which was less expensive (at the expense of some features) and had provisions for wider angle lenses. The M2 had very minor changes through its lifetime and continued essentially the same through 1968 when it was replaced by the M4. (There was a small production in 1969 of a M2 with RapidLoading called the M2-R). Using the text or images on this website without permission on an ebay auction or any other site is a violation of federal law. My own personal M2 (serial #9823xx) is a relatively early 1959 model that has the lever-rewind (early-early ones have a button on the front that you push to initiate the rewind) but does not have a self-timer. Late-production models have the self-timer. It's a bit confusing that the M3 is followed by the M2 (then the M1) then the M4. It's not an arithmetic progression. 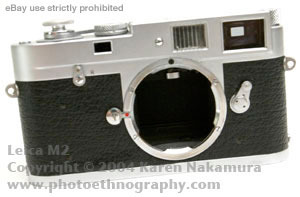 The '3' in the M3 stood for the 3 projected framelines, as well as being a natural development of the Leica IIIf. 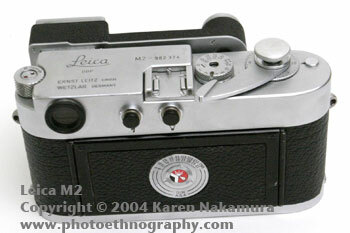 The M2 was a simplified M3 (and since a Leica II is a simplified Leica III), it was natural that it would be the M2. The M4 was a further development and had four framelines, so it became the M4. The M5 is a totally new redesign that many people did not like. That was followed by the M4-2 and then much later on, the M6 and M6TTL which had six framelines (28-35-50-75-90-135). Then came the M7 with automatic exposure and an electronic shutter; and the latest is the MP which is a return to an all mechanical camera (essentially an M6 with M3 rewind knob). Knob rewind: The one thing about the M2 & M3 that seems to irritate people the most is the knob rewind. I really don't see what the big deal is about. It's not that difficult to rewind with a knob, especially if you use the two-handed "crank" method. You can buy a variety of M2/M3/MP knob rewind adapters which convert it to a rewind crank. Leica most famously sells their MP rewind crank for $200 which is a bit steep, if you ask me. Steven Gandy has a very nice one for $99 on his Cameraquest.com website. 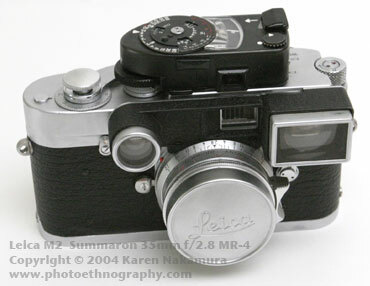 Rangefinder: The M2 has three framelines: 35-50-90mm. Each focal-length frameline appears individually unlike on the M3 where the 50mm frameline is always visible and the 90 and 135mm show up on demand. 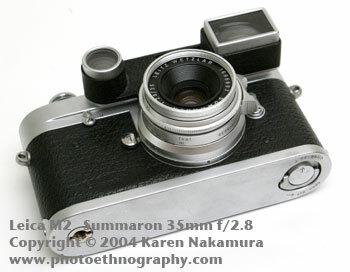 The M2 rangefinder mechanism is considerably simpler than the extremely complex M3 rangefinder. This is the major reason the M2 was less expensive than the M3. But this came at the loss of some magnification and a slightly darker image. Also, the M2 finder is more susceptible to flare in contrasty light. Using the text or images on this website without permission on an ebay auction or any other site is a violation of federal law. Quickload: My M2 came with the Quickload adapter set in it. This allows for much faster film reloads compared to the old M3 system where you had to take out the take-up spool and thread it. Two thumbs up! It's not as good as the later rapid load in the M2-R or M4, but it's not bad at all. To load the Quickload, you do have to fiddle a little bit. In my case, it seems as if the leader of contemporary pre-loaded 35mm films are a bit too thick, so I just tear it a little bit so that it fits. Using the text or images on this website without permission on an ebay auction or any other site is a violation of federal law. DOF Guide: The rangefinder rectangle in the M2 has two notches on the top and bottom. The top one is thicker and represents the depth of field of a 50mm lens at f/16. The bottom one is thinner and represents the depth of field of a 50mm lens at f/5.6. 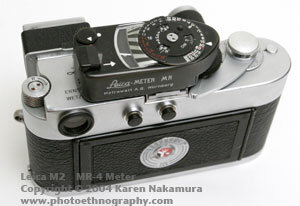 Light Meter: All Leicas before the M5 do not have built-in light meters. For the M2, you can either use the classic Metrawatt produced Leicameter MR; or if you want something more modern, use the Gossen Digisix. My M2 came with a Leicameter MR-4 which is a revised MR that has a better meter-button layout. The MR is really the only Leicameter that is worth using (as opposed to collecting). The previous models (Meter, Meter 2, Meter M, Meter MC) are all selenium meters. And most selenium meters are now erratic or non-functioning due to the deterioration of the selenium cell. Even when they worked, selenium cells had poor low-light sensitivity.